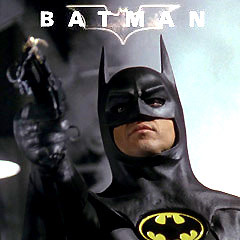 The film opened with the disguised, black-caped crusader Batman (Michael Keaton) confronting two robbers in a dark, deserted, crime-ridden Gotham City alleyway after they had assaulted a tourist couple with a young boy - he kicked one thug through a doorway, and menaced the other one - warning him to tell his criminal friends about their new adversary ("I want you to tell all your friends about me...I'm Batman"). The newly-elected, determined District Attorney Harvey Dent (Billy Dee Williams) vowed with Gotham City's Mayor Borg (Lee Wallace) and Police Commissioner James Gordon (Pat Hingle) to rid the streets of criminals (a syndicate called a "nest of vipers") led by kingpin crime boss Carl Grissom (Jack Palance) and his second in command, chief enforcer-henchman Jack Napier (Jack Nicholson). However, the police department was corrupted from the inside (Lt. Eckhardt (William Hootkins) was working with the syndicate to keep Harvey Dent from uncovering their crimes). In a sideplot, Grissom's moll Alicia Hunt (Jerry Hall) was two-timing her boss with the dapper dandy, Jack. Gotham Globe reporter Alexander Knox (Robert Wuhl) was stymied in obtaining information from the police about the "giant bat" and his assault on the two goons. According to Knox, the punkish thugs in town were scared of the Bat ("They say he can't be killed. They say he drinks blood"). Knox's long-legged, fellow photojournalist Vicki Vale (Kim Basinger) joined him to investigate the strange rumors of a shadowy bat figure ("a winged vigilante"), who served as a crime-fighter in the city. Meanwhile, Grissom was worried about a connection being made between his nefarious activities and Axis Chemicals - so Jack Napier proposed: "I say we break into the place, trash the office, and make off with the records and say it was industrial espionage" - Grissom sent Napier to raid the factory and "handle this operation personally," although he tipped off Lieut. Eckhardt for a set-up (he was suspicious of an affair between Jack and Alicia). The same evening, reporters Vicki and Knox attended a benefit for the city (planned for its public 200th birthday festival highlighted by a parade), hosted at the mansion of billionaire philanthropist Bruce Wayne (Michael Keaton), heir of Wayne Enterprises. During the heist at Axis Chemicals, Napier realized the police had received a tip-off ("We've been ratted out, boys") when the safe was empty. Commissioner Gordon arrived on the scene and commanded that Napier be taken alive. During the shoot-out firefight with police, Batman arrived and also pursued Napier. When Napier shot at Batman, the bullet ricocheted off Batman's outfit and sliced through his face, causing him to topple over a railing. He was held by his hand momentarily in mid-air by Batman, but then fell when released and splashed into a vat of greenish, acidic toxic chemicals. The vat led to an adjacent reservoir closeby where Napier's hand emerged from Gotham's East River. After a botched surgery on his face (with nerves completely severed), Jack laughed maniacally when he saw his face in a mirror (off-screen). The newly-transformed Napier - now calling himself the Joker - entered boss Carl Grissom's office, hidden in the dark, and accused him of a frame-up: "You set me up over a woman! A WOMAN!" and muttered (ironically): "You must be insane." When Carl proposed a deal to save his life, Jack stepped into the light to reveal his new grotesquely transformed visage -- a deathly, pure white face, green hair and an impossibly wide, hideous, permanent grin with blood-red lips ("Jack is dead, my friend. You can call me... Joker! And as you can see, I'm a lot happier!"). Grissom was repeatedly shot dead as the clownish Joker bounced, hopped, and twirled around. After killing his former boss, he sighed nonchalantly: "Oh, what a day!" To Knox's jealous consternation, the slinky Vicki Vale began dating Bruce Wayne ("The guy's a stiff. He's a rich stiff, but you could do much better") with devoted butler Alfred (Michael Gough) in attendance, and they slept together after a first awkward date. Knox and Vicki vainly researched Bruce Wayne's past, finding "no photos, no history, no nothing. Who is this guy?" While following him, Vicki saw Wayne enigmatically lay two long-stemmed roses on a stretch of sidewalk at Pearl and Phillips Streets. The Joker schemed to spread a reign of terror over Gotham City, although upset by the headlines: "WINGED FREAK TERRORIZES GOTHAM'S GANGLAND," and he vowed: "Wait'll they get a load of me." He prepared to subdue all of Grissom's men by 'greasing' them and by intimidation, to take over his empire, and he fried oily gangster Antoine "Tony" Rotelli (Edwin Craig) with a concealed electrified hand-shake buzzer after being challenged. The "highly intelligent, emotionally unstable" Joker also began a deadly scheme of product tampering -- chemically altering beauty parlor, cosmetic and common hygiene products (also foods and alcohol) with poisonous Smylex, causing a grinning death ("So remember, put on a happy face"), causing a "shopping nightmare" in Gotham. He also became romantically interested in Vicki, Wayne's girlfriend, after ogling her picture ("A lovely beast like that running around could put steam in a man's strides"). With his gang, the Joker defaced paintings in the Flugelheim Museum after gassing the visitors, personally signing: "Joker was Here" and he lured Vicki Vale to a meeting with him there, purportedly to look at her journalistic photographs. He claimed: "I am the world's first fully-functioning homicidal artist" - demonstrated by showing her the deformed face of Alicia ("she's a living work of art"). Batman tracked down the Joker and rescued Vicki from the insane madman with his gadgets (a steel gauntlet projecting metal spikes on wires), prompting the Joker to remark: "Where does he get those wonderful toys? ", and whisked her away in his high-powered, remote-controlled Batmobile with afterburners. After a car and footchase, the Joker's thugs almost demasked Batman's cowl (and Vicki snapped a photo), but he revived and defeated his opponents, and then drove with her on a deserted stretch of road to return to his underground BatCave, a state-of-the-art crime lab. He disclosed that he had determined that the Joker had tainted hundreds of basic chemicals at their source, and combinations of chemicals when mixed were deadly - it wasn't just individual products that were the problem. He rendered her unconscious and took back the film that she had snapped of him. The next days' headlines read: "Batman Cracks Joker's Poison Code! Citizens Told to Avoid the Following Products..." - the Joker was incensed: "I have given a name to my pain and it is Batman." Meanwhile, Knox discovered in newspaper archives that young Wayne as a child saw his parents murdered ("Thomas Wayne Murdered. Only Child Survives! Prominent Doctor & Wife Slain in Robbery") - the reason he laid flowers in the alleyway. City officials announced that the city's festival and parade was being postponed since public safety couldn't be guaranteed, although the Joker announced his own plan to hold the parade ("I love a good party. So, truce. Commence au festival!"). To lure citizens to attend, he promised cash and a show-down with Batman, challenging the masked crusader: "At midnight, I will dump 20 million in cash on the crowd....and there will be entertainment. The big dukeroo. With me in one corner and in the other corner the man who has brought real terror to Gotham City, Batman...Just the two of us...I have taken off my make-up. Let's see if you can take off yours." In a flashback of the night of his parents' murders, Bruce deduced that it was the Joker (who spoke his familiar catchphrase: "Did you ever dance with the devil in the pale moonlight?" and was identified by his name as Jack), as a young criminal, who had killed them while robbing his mother's pearl necklace. Batman went after the Joker, and detonated explosions at the chemical factory, but missed killing the Joker, who waved and laughed "Missed me" from a helicopter. The 200th anniversary parade commenced, with the Joker riding on the top of a gigantic float, with helpers throwing out wads of cash ("free money") to the crowds, exhibiting "Gotham's greed" - although the money was soon revealed to be fake Joker Money. His dastardly plan was to kill the parade-goers with lethal green Smylex gas from one of the giant balloons, joking: "If you gotta go, go with a smile." Batman flew into the city in his Batwing to foil his plan by snagging the poison-spewing balloons and releasing them far away. As she was covering the event, Vicki witnessed the Joker shooting down Batman's Batwing with a long-barreled pistol, causing it to crash into church steps. When she came to his rescue in the smoldering wreckage, she was kidnapped and taken up winding wooden stairs to the top of Gotham City Cathedral - to the belltower, with Batman following close behind. The Joker sprayed a giant bell in the belfry with acid, causing it to fall and smash the belltower staircase in its descent, and preventing Comm. Gordon and police from following. The mad Joker performed a danse macabre with Vicki ("We were made for each other. Beauty and the Beast") while waiting for his rescue helicopter. Batman attacked him after greeting him: "Ever dance with the devil in the pale moonlight?" and vowed to kill him for murdering his parents. After a long fight together as the two doppelgangers faced off (in a scene reminiscent of Metropolis (1927)), Vicki and Batman found themselves dangling from the ledge of the belltower. After quipping, "Well, it's time to retire. Feel free to drop in. Sometimes, I just kill myself," The Joker found himself barely hanging onto his own rescue helicopter's rope ladder, with his right leg bat-hook-connected to one of the cathedral's heavy stone gargoyles. When the gargoyle broke off in mid-air as he was pulled upward, the Joker's leg was weighted down and he could no longer hold onto the rope ladder - he let go. Meanwhile, Batman saved Vicki from falling, and they swayed together in each other's arms at the end of a tether. There was the macabre sight, after the Joker's fall, of his still-grinning face as he lay dead. He was splayed on his back on the church's front steps many stories below. A toy (in proxy for the villain) laughed maniacally in his pocket. Commissioner Gordon announced at a press conference: "The reign of crime is over" - and DA Harvey Dent read aloud a letter from Batman that promised: "If the forces of evil should rise again to cast a shadow on the heart of the city, Call me." The Commissioner unveiled a Bat-Signal that was to be used to summon Batman. The closing shot was of Batman silhouetted on a rooftop against the Gotham skyline, watching the Bat-Signal projected and shining in the distance. From 1989-2008, there were six action-adventure superhero Batman films (all from Warner Bros. studios, and all PG-13 rated) with four different actors in the title role. The first film was a reprise of the character from the popular, campy mid-60s TV series and its accompanying full-length feature film in 1966 about superhero Batman - also known as the Dark Knight or the Caped Crusader, based on DC Comics' Batman created by Bob Kane. The film - a noirish, dark blockbuster epic film - was a critical and financial success, earning over $411 million in box office totals (worldwide) and $251.2 million (domestically), from a budget of only $35 million. Comic book fans sent thousands (50,000) of letters to Warner Bros. to protest Michael Keaton's casting as Batman. Jack Nicholson, portraying the Batman's arch-enemy the Joker in Tim Burton's comic-book blockbuster, took a stake in the film's profits (and merchandising). He reportedly netted $50 million as his personal take. It received only one Academy Award nomination (and won) the Oscar for Best Art Direction.